Un-paralleled search capabilities for finding celestial objects. Enter Saturn, Messier 64 or even something peculiar as ESO350-40B and STAR Atlas:PRO easily locates that object for you. A chart of the object's location is displayed and astrophysical information describing the object may also be examined. 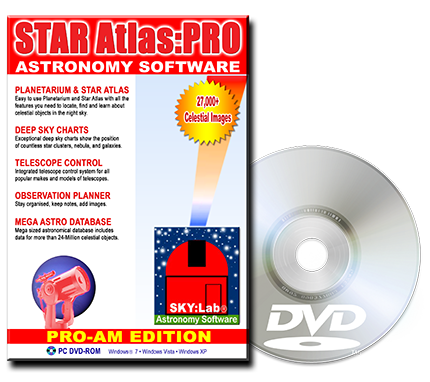 You can also send your telescope slewing straight to it or even submit the object to STAR Atlas:PRO's Observation Planner, to be scheduled for your later observation. And for every celestial object you may attach your own images. Each of STAR Atlas:PRO's popular and historical astronomical catalogues may be individually browsed, listed, and searched, you can sort Comets in order of brightness to easily locate the brightest ones and then chart their movement through the sky! Find the planets, track the positions of Jupiter's Moons and Great Red Spot in real-time. Find galaxy clusters and supernova remnants. You can even search for Variable & Multiple Stars that exhibit only certain variability and brightness ranges, all part of STAR Atlas:PRO's powerful find and search features. Easily find popular objects like the Andromeda Galaxy, the Beehive Cluster, and Struve's Lost Nebula, all just just a click away! Access a huge range of other astronomical catalogues where an astounding amount of data is right at your fingertips. Also at hand is the Observation List Generator, a very powerful search tool for producing lists of celestial objects that fit your search criteria. In fact the Astronomical Database Manager provides you with dozens of other similar functions and unique ways to assist you in finding the objects your looking for. An example of the extensive information that may be displayed for just one star ! Star Name Information: BETELGEUSE; Betelguex; Betelgeuze; Beteiguex; Al Mankib. Double & Multiple Star information: Components B-E all 11 to 14.5v at sep. 40" to 174" from A. D 13.5 at 77", optical. speckle interferometric observations in 1983 November (Karovska et al. 1986, ApJ, 308, 360) show A to be a triple system with closer companion at 0.06" (mag. diff. 3.4 at H alpha) and more distant companion at 0.51" (mag. diff. 4.6 at H alpha). Miscellaneous Information: Radio star. Circumstellar shell of gas and dust. The gas shell detached from photosphere at about 5 stellar radii. Diam. of optically thin dust shell possibly 1".5. Surrounded by reflection nebula. Gas shell up to 100 R, dust shell from 12 to 250 R. Highly darkened limb. Stellar radii / diameter Information: The first star whose diameter was measured with the interferometer, .047", by Michelson and Pease at Mt. Wilson in 1920. Radial and/or Rotational Velocity Information: Expanding circumstellar shell, extending at least 29" or about 600 stellar radii. If rate constant, initial potassium ejection about 2700 years ago. 2.85-cm radio emission indicates mass loss. Spectra Information: Ultraviolet FeII emission. 5-micron observations indicate carbon monoxide. STRATOSCOPE II observations indicate infrared H2O bands. UV observations from OAO-2 indicate C and O underabundant. MgII emissions indicate a cooler shell surrounding the supergiant. Spectroscopic binaries Information: ADS 4506A, 5.781y, K 3.08k/s, V0 +20.33k/s, asini 81.773. ADS 4506A, SRc 0.40 - 1.3V, 2335d. Also superimposed waves 200-400d. This is the distance in Light Years to the Star. Colour Index in Cousins' System. Henry Draper HD Catalogue number. Cape Photographic DM Catalogue number. Proper Motion RA in milli-arc-seconds per year in Right Ascension. Proper Motion DEC in milli-arc-seconds per year in Declination. Catalogue of Components of Double and Multiple Stars (CCDM) Identifier. Magnitude at Maximum brightness (5th percentile Mag). Magnitude at Minimum brightness (95th percentile Mag). (theta) Position Angle between components. (rho) Angular Separation of components. Common information to all Catalogues includes RA, DEC, ALT. AZ. Rise, Set, and Transit. If you thought that was all the information there was about the star Betelgeuse ( Alpha Orionis ), there are actually two (2) further screens of information about this star. a catalogue screen that displays the Star's Variability data. a catalogue screen that displays information about each component in a Double/Multiple star system.